Here at Kailash Blades all knives are made individually by hand, to order. That gives us a lot of flexibility in manufacture and is why we offer so many different variants and take a semi custom approach with almost all of our blades. However, even with the level of customisation that we offer, sometimes you need something a little bit different or you have a special project in mind. It is for this reason that we have a custom section. Maybe you want a sharpened back edge on a knife that doesn’t traditionally have one or the addition of a fuller, serrations or bolster. Perhaps you’re after a blade in an unusual length or a different spine thickness. Potentially you like the ergonomics of the Scourge handle and want it with a simpler blade, like that on the regent long knife? Understandably too, that would be pretty damn cool. All these potential designs fall under the “Custom Enquiry” topic on our contact form. If you send us an email though there we’ll begin the process of consultation and give you a quote before we continue with the custom order. Just as a rough estimate these minor alterations would perhaps add another $30-50 to the price, while a blade/handle swap would depend on how much more difficult it would make the manufacturing process. All of the previous options stated regard changes that do not involve altering the profile of the blade or handle. For customs that require a new template for the blacksmiths to follow (new blade shape or new blade length for any modern blade) you should email us through the “FULL Custom Enquiry” topic in the contact form. From there you will be put in touch with our desginer, Andrew Lucas, who will then consult with you on design and pricing before organising for your unique blade to be manufactured. The Full Custom Enquiry also applies to any completely new or special projects you might have. You looking for a special run of blades to be made with your logo etched into it? Or are you looking to get something completely new made? You really want a 5160 katana made? 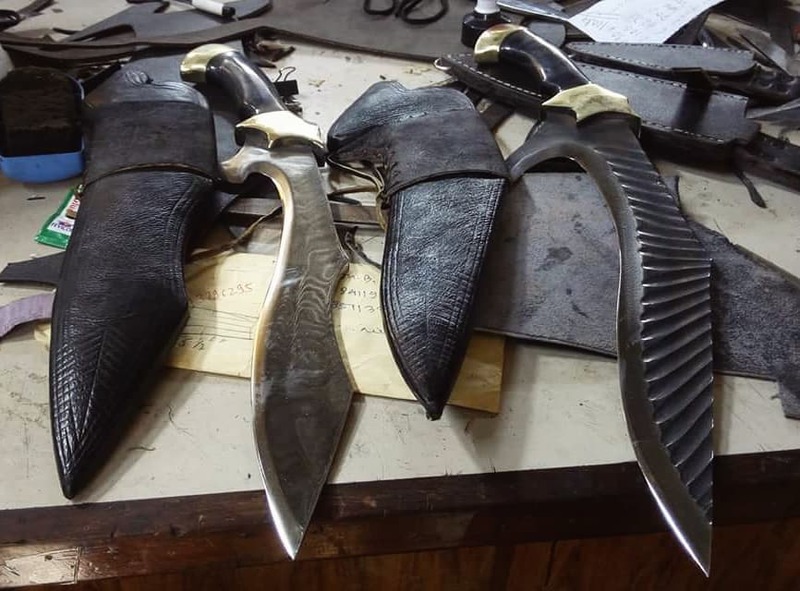 You’re after a small bird and trout knife as a companion for a khukuri and want a dual sheath? Keep in mind that we refuse to make copies of pre-existing designs (unless historical) but are happy to take inspiration from a photo and then modify it from there. While we can’t promise you we’ll be able to make it (we are somewhat limited in a few aspects of manufacturing due to traditional processes), we can promise you that we’ll look into it and give it full consideration. Andrew loves to flex his design muscles and the Blacksmiths love a challenge. ou’re after a small bird and trout knife as a companion for a khukuri and want a dual sheath? Every custom starts with a discussion about your needs. 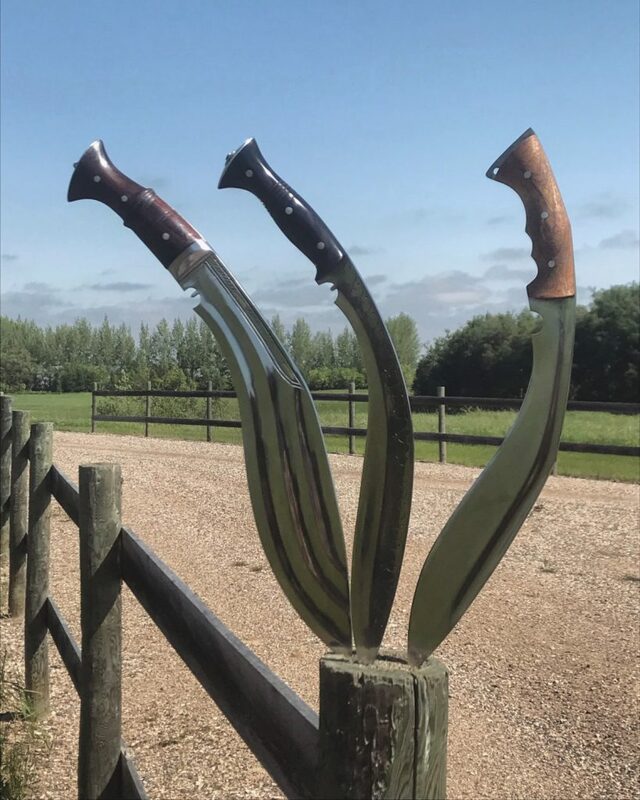 The kind of things the knife is going to be used for, if it'll be a workhorse, or for martial arts or just a display piece. That helps inform the decisions we make regarding balance, materials, aesthetics, ergonomics and grind geometry. After that we can punch out a ball park cost quote and if it's all good then we start on sketching. These sketches start rough and get refined and corrected based on customer feedback until we land at the perfect design. Once the pricing is settled and the invoice is paid, the knife waits in queue to be forged for about two weeks. When it's finally your turn it goes through two stages of forging, first it's hot cut and rough forged to shape with a team of sledgehammer wielding blacksmiths, then its forged my finely individually using a smaller knife to refine the thicknesses and form. From here it hits the grinder to clean up the outline and remove any excess then it's quenched, tempered, cleaned, handles are fitted and shaped then it's given its final finishing and sent off to you. This whole process takes about 4.5-5 weeks with 5-10 days shipping time. The whole time you're kept up to date with weekly photos of current progress as you see your design becoming a reality. Finally, it rocks up at your doorstep and you get to see if it was worth the wait. We can pretty safely assure you that it will be. The way that we approach custom designs isn't just something that sets us aside from any other Nepalese manufacturer, but is also something which helps us stand out compared to the rest of the world. Our unique processes allow us to deliver a fully custom blade, forged by hand at incredibly high value in quite a short timeframe, all the while letting you see the blade being born and alowing you to form a deeper connection with your knife at the end of the day. factory or in a western one man blacksmithing operation. So if you're looking to get something a little bit different made, please get in touch. We love blades and the opportunity to make a blade that's out of the ordinary is the kind of thing we'll jump at.